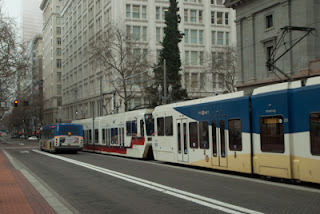 It has been about six months since I moved to Portland, about 3 months since I updated you on my travels on the Trimet System. Last time my travel was pretty straight forward: Take the 54 and 57 to work, then ride MAX, WES and 78 to PCC Sylvania and back home on the 44 or I would ride MAX, the 6, and 44 to PCC. After Christmas, my life completely changed and I am always riding the 44 to PCC and back but my work schedule has me traveling a lot more which you can see from the number of buses I have rode down below. *The three I have not ridden 106, 119, and 126 I have never seen them either so not sure if they are still in service, being repainted since many of these cars are getting new paint schemes or just missing them. *Not sure how many of these are actually still running. 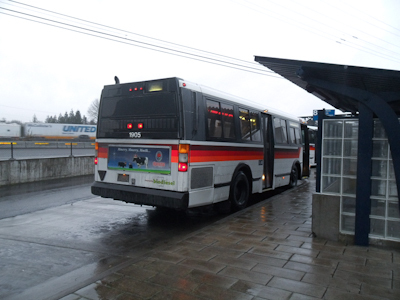 *These are buses normally assigned to the 44 Monday-Friday so its no surprise that I ridden them so many times. *Since these are the regular buses assigned to the 54 and 57 and sometimes the 78, its no wonder I was able to ride all them over a six month period. Although I have a very love/hate relationship with low floor buses:: easier to get on and off, faster wheelchair loading, however they loose capacity, are not the comfortable to ride in, and are not that well put together, I will have to say that the D40LFR's from 2009 do seem to making some headway quality wise. 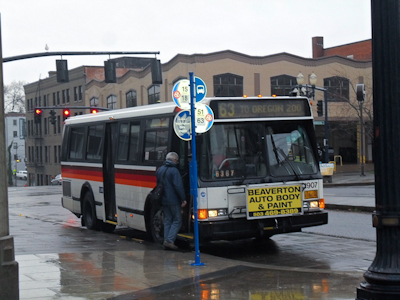 While Trimet may be a bus fans paradise with the large number of Flexible Metro's still around, Trimet does have an aging fleet and with Flxible having been out of business for almost 17 years now, I imagine that some parts are now becoming difficult to get. 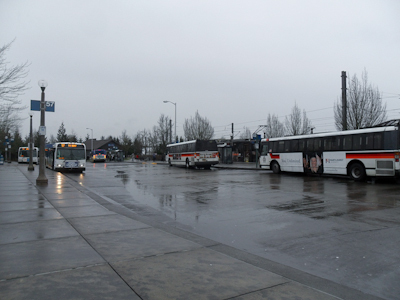 Trimet does have 55 diesel buses on order along with 4 hybrids which are coming from Gillig. While Trimet has many haters out there including many of its own bus drivers, as a passenger I have to say for the most part Trimet has done an excellent job. Only once has there been a bus break down that affected me and that was when I was still riding the 54 westbound and one of them broke down leaving the garage. 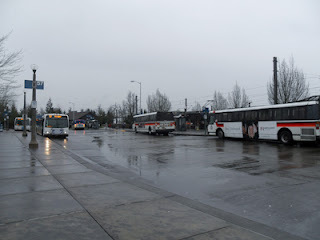 However, Trimet while the 54 is run out of the Merlo garage on the westside, they pulled a bus out of the Central Garage on the near east side and the bus was only running a few minutes late. The only other incident actually worked to my benefit. One of the 1992 Flxible 30' Metros was overheating and it caused the bus to run about 10 minutes late which meant I did not have to way 20 minutes for the next bus to arrive. Drivers on the other hand are a mix bag. 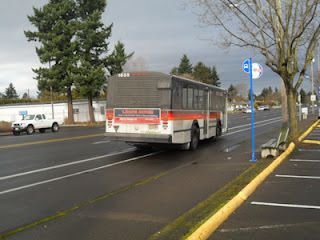 Trimet does have some excellent drivers. I have sent in commendations to Trimet on two of its drivers. The first one was a driver on the 54 who is now working the 67. This person has a wonderful personality, knows how to treat customers, and was always a pleasure to ride with. Sadly the replacement on the 54 has not lived up to him. The other driver I sent in a commendation for was on the 44. This person is extremely friendly with a wise cracking personality that works perfectly for the clientele on the 44. I rode with him a few times when I needed to make trips to downtown before heading to PCC from Beaverton. There is only one driver I have come close to filing a complaint about. This person shows a lack of personality when you board the bus and this person gives you a look like the driver would rather cut your throat than have you on the bus. This person never says a word, just gives you the dirty look. If a customer asks this person a question the customer is luck if they get a grunt. I always try to wish the driver a good day, afternoon, etc. when I get off the bus if the bus is not extremely crowded. One time when getting of the bus I gave this driver the standard good day and I actually got a response of the driver!! The driver say "whatever." I guess its better than a something else the person could have said. I have ridden with this person on a couple of routes so the person must be extra board. Clearly this is someone who needs to find a job where they do not have to deal with the public. On Tuesday, I had my first encounter of adverse weather conditions on Trimet. Once again Trimet did what it was supposed to do and provided the best possible service under less than ideal conditions. 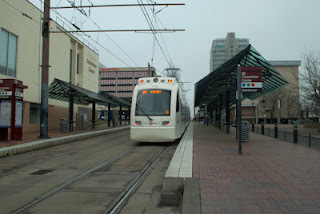 Below is a picture of my 44 to PCC Sylvania on that day. 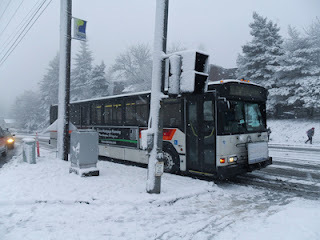 In fact the bus had to get around several cars that got stuck along Capital Hwy. and SW 49th. The driver did a great job and we arrived at our destination in good time. In interesting note is that this was my first time every riding a transit bus with chains. The Utah Transit Authority I believe uses chains on its ski buses when conditions are bad but since I am not a skier, I never rode the buses to the ski conditions. Another interesting note is the bus pictured above is equipped with automatic chains that engage with the flip of a toggle switch. The driver said these buses are the only ones equipped with them. I wonder if these were an add on order from another transit agency (add on orders is when a transit agency adds a bus order to another agencies order to get a better price on buses). After six months of regularly Trimet, I can say that Trimet does what it is supposed to. Provide the best possible service to the most riders possible with the budget given them. 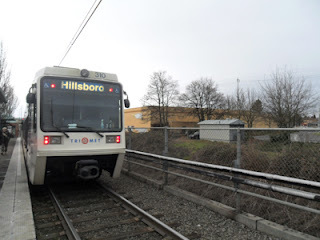 I encounter many people in my travels that want to whine about one thing or another when it comes to Trimet, but overall service does the job it is supposed to. Is Trimet a perfect agency? Of course not, there is issues that need to be fixed but it does its job well. When we look at any development project or even a major rehabilitation, we often look at how transit oriented a project may be, or how sustainable the project should be, but how often do we look at how survivable a building will be? The thought of making a building survivable may scare some people, and developers and bean counters will start adding up the cost, but the question is, should we be taking survive-ability into account when looking at projects? Lets take a look at the Portland, Oregon region. How many buildings in Portland are going to survive the next time the Cascadia subduction zone has a major earthquake? How many people will die because the buildings they live and work in are not designed to handle the stresses of a major earthquake? Those of us who grew up in Southern California probably don't even bat an eye with the thought of an earthquake. However, the earthquake in Japan last year should be a wake up call. The country of Japan has prepared for years for major earthquakes and tsunami's yet still was not prepared for the devastation caused by twin disasters last year. In fact most experts thought that type of earthquake could not happen in that part of Japan but they were proven wrong. Of course what are the chances of a major earthquake hitting the Portland area or any area for that matter. The Portland area has been hit by subduction zone earthquakes on a regular basis for thousands of years, we are talking earthquakes of 9+ of the Richter scale. The average between earthquakes is around 250 years although there has been breaks of 500 years between earthquakes but the last one was about 10,000 years ago. When did the last earthquake like this hit the area? In a few days we will pass 312 years since the last major subduction zone earthquake hit. But lets not look at just the Portland region, any area that is a geological or meteorological hazard site needs to look at survive-ability when it comes to construction zones. Of course let us not forget that one of the worse earthquakes in recorded US history did not occur in the western U.S. but instead in the mid-west and our most recent earthquake hit the east coast. But other areas of the country are prone to natural disasters on a regular basis and how prepared are we? The problem is, developers are looking to make the most money (nothing wrong with that except that when it comes into conflict with how safe an area is). In Salt Lake City, or the city of Draper to be exact homes have been built on a hill of sand that is already is causing stability issues for many homes and will be extremely dangerous when an earthquake hits that area. Further developers are allowed to build subdivisions in areas with only one escape route on the side of a mountain so that if a wild fire hits with little warning people may end up trapped with no escape. The second presenter Chris Higgins (Dr. Doom), makes an interesting observation about a small item that makes all homes safer in the event of an earthquake: The Northridge Valve. It is a device that will shut off natural gas to a home when an earthquake hits. He points out that they are not required in Oregon but our neighbors in California and Washington do require them. A less than $50.00 item that could save countless lives is not required in Oregon. Few parts of the country are immune to one disaster or another. However, how often do we take survive-ability into account when looking at developments and rehabilitation's?